On the heels of launching efforts to save a veteran who said he wanted to kill himself, James Woods — whose Twitter feed has become one of the more popular conservative follows — offered his fans a reminder of the self-proclaimed superiority of the president whose legacy has been all but eliminated within the first two years of Trump's presidency. "Wherein #Obama dismisses the value of every political figure he’s dealt with in the entire world in one minute and nineteen seconds. Amazing therefore that the 'world's smartest man' accomplished absolutely nothing in eight of the longest years in history," wrote Woods, in a tweet noted by Twitchy. "Here's the interesting thing that happens when you're president, or when you go through the experience of being president," says Obama, a comment his audience finds funny. "So you start off, you know, you're a community organizer, and you're struggling to get people to recognize each other's common interests. You know, you're trying to get some project done in a small community. You start thinking, 'Okay, you know what, this alderman's a knucklehead and they're resistant to doing the right thing, and so I need to get more knowledge, more power, more influence so I can really have an impact.' And so you go to the state legislature, and you look around and say, well, these jamokes, I mean they — not all of them, but I'm just saying you start getting that sense of 'This is just like dealing with that alderman, so I gotta do something different.'" Having trashed basically everyone on the local and state level, Obama takes his disappointment with all the "jamokes" all the way to the top: "Then you go to the U.S. Senate, and you're looking around, and you're like, 'Ah man...' And then when you're president, you're sitting in these international meetings, and it's like the G20 and you've got all these world leaders. And it's the same people." 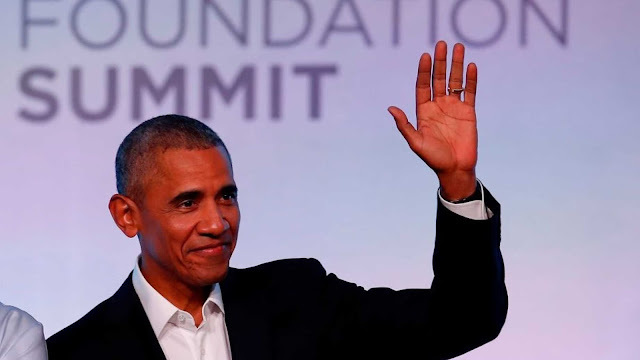 While Obama's dismissal of all leaders, national and international alike, is going viral, the most quoted segment of his performance Tuesday is his suggestion that anyone opposing the progressive climate change agenda are "confused, blind, shrouded with hate, anger, racism, mommy issues." "Climate change, we're going to have to come up with some new technologies to solve the problem as much as we need to," he said. "Although even on something like that, right now I could take off the shelf existing technologies, we could reduce carbon emissions by let's say 30 percent, without any, you know it's not like we would have to go back to caves and you know live off, you know, fire. We could have electricity and smartphones and all that stuff which would buy us probably another 20, 30 years for that technological breakthrough that's necessary. The reason we don't do it is because we are still confused, blind, shrouded with hate, anger, racism, mommy issues." He closed out the comments by congratulating himself on his commitment to "reason and logic," saying, "People call me Spock for a reason: I believe in reason and logic and all these enlightenment values."